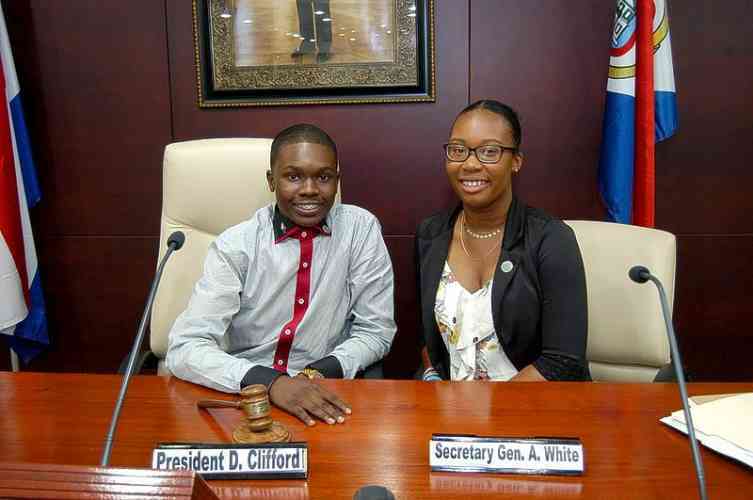 St. Maarten Youth Parliament President David Clifford and Secretary Aarin White. PHILIPSBURG–“Prepared or not, school reopens this week. I applaud every student rewarded by promotion for continuing to show hard work and dedication even after the natural disaster we faced. To those repeating, don’t be too hard on yourself,” stated St. Maarten Youth Parliament President David Clifford on Sunday. “Try looking at this year as an opportunity to progress even more in ways that you planned to the year before. As my wise principal Mrs. Baly would say, ‘For every setback there is a comeback.’ I do hope this year is your year of comeback! “Well wishes to us students who are to face the school year 2018-2019! I must say that last year was indeed challenging, but this year we’re the challengers! Challenging every obstacle put in our way to deter us from our goal. “For some this year may be a first in a new school. Specifically to first-formers, always remember that this is a new step in life. Do not do things that will put your education in jeopardy. High school is a totally different atmosphere. You will meet children that are different, but don’t lose yourself trying to meet their standards. It just won’t work. “To every teacher: we, your students, really do appreciate you. We may have a hard time showing it, but we know for sure the feelings are mutual. Your sacrifices don’t go unnoticed. This year may be tough for you due to the shortage of teachers on the island, but there is no task you can’t handle. “I would personally like to encourage qualified teachers to apply. It might not be easy, but you are contributing to the future development of St. Maarten, which I feel is one of the most important things a citizen can do. “Let’s make this school year a great one. Let us leave all the procrastination, violence and lackadaisical attitudes in the past. We will walk into this school year only expecting and doing our best.